A pie is not a typical staple food when you are vegetarian, but a good pastry with some wholesome veggies never goes astray in my mind. Reading Sugardough’s menu from their chalkboard I felt lucky to live in Melbourne where vegetarian, vegan and gluten-free options have almost become obligatory for any successful eatery. I ordered the vegetable pie. 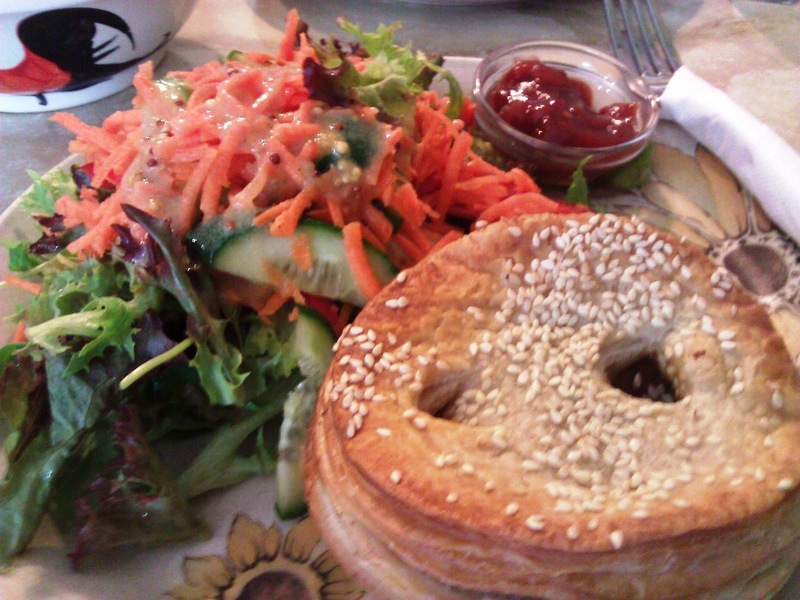 There was also a vegan pastie, salads and many cakes. The pie was served with a generous salad of mixed leaves, carrot and cucumber. The pastry was perfectly puffed concealing a hearty stew of vegetables. With tomato relish on the side, this was the perfect light lunch for the hot day last Saturday. Sugardough has a relaxed atmosphere and tasty, unpretentious food.